The entire island of Lanzarote is a UNESCO biosphere reserve, and it contains no less than 13 ‘protected areas’ including a Spanish National Park – Timanfaya, where Raquel Welch was memorably filmed in ‘One Million Years BC’. As your base we have chosen Playa Blanca, a quieter resort in the extreme south of the island, close to the Papagayo nature reserve. The artist Cesar Manrique left an indelible mark on the island, not just in the artistic heritage, but in his (and his followers’) dedication to maintaining the unique landscapes of his island and opposition to tasteless over-development. As you explore Lanzarote, you will see that hi-rise building has been avoided, that the traditional rural architecture with its white buildings and striking green paintwork has been respected, and above all that the island’s extraordinary landscapes have been maintained unblemished. And all of this in a year round warm climate. Day One: Flight to Lanzarote, transfer to your hotel for seven nights half board accommodation. Transfer time 40 minutes. Days Two to Seven: In Playa Blanca, with three included excursions, two within Lanzarote and one to the neighbouring island of Fuerteventura. Our chosen resort of Playa Blanca is quieter than most of the island’s resorts, yet has every amenity. A particular feature is the long promenade which runs close to the harbour, passing the stunning new upmarket development of Marina Rubicon and continuing out towards Papagayo. There are good island bus services, allowing you to get around by public transport if you wish. 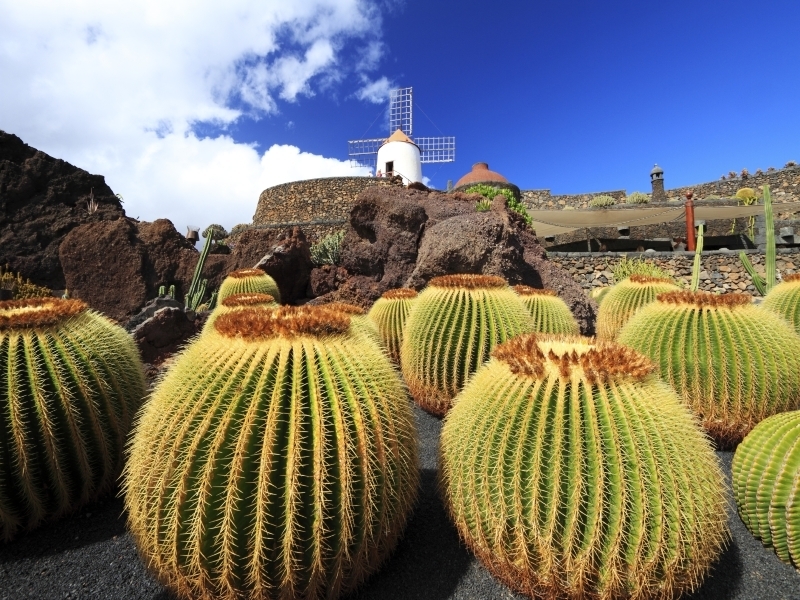 Manrique’s Lanzarote: your included excursion takes you to see different aspects of Manrique’s Isle, such as Teguise – the old inland capital, Bateria del Rio, and the artist’s stunning Cactus Garden. Cacti were important to the island: to this day there are fields of prickly pear cactus – this was grown to harvest cochineal beetles and the brilliant red dye they produce, one of the main industries of the island until the 19th century. The excursion in the south of Lanzarote includes a range of unlikely scenery. You will see the pretty white painted village of Yaiza, the coastal salt-pans of Janubio, and the cliffs near El Golfo. Then you drive amid the unique scenery of the Volcanoes Natural Park, and finish in the unusual vineyards of La Geria, where man’s ingenuity has made vines thrive in a hostile setting. Fuerteventura: your third excursion begins with a 20 minute walk (taxis are available) to the harbour where you catch the ferry to Corralejo, Fuerteventura. It is a 35 minute crossing, please keep an eye out for pods of dolphins which are frequently seen here. Just south of Corralejo is the natural park area of Las Dunas, an enormous sandy area similar to the Sahara Desert. Amongst other stops, you will also visit the island’s former capital, Betancuria. The scenery as you travel across the island is stunning. Extend your holiday – extra week available in Playa Blanca. A WALKING HOLIDAY is also available from this hotel. Please ask for a copy of our Walking Holidays brochure.